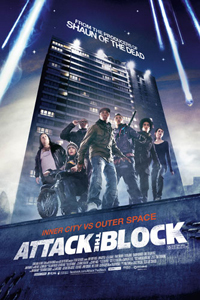 As the tagline says, “Inner City Versus Outer Space”, and you know what, I enjoyed this film. Aliens are invading Earth once again, except this time they find themselves landing in one of London’s council estates! They are huge, savage creatures with neon-glowing teeth, yet they meet their match when faced with England’s very worst youths! The film opens on November fifth, bonfire night, and immediately makes villains of our lead characters, who mug a young nurse before butchering an alien life form that crash lands. Pride quickly changes to fear as the aliens (and their drug boss) hunt them down relentlessly, and soon extreme situations could make heroes out of them. There are a lot of alien movies out there, some of them work (District 9) others do not (Battle: Los Angeles), and this is somewhere in the middle. Attack doesn’t shy away from showing us the monsters, which is great because they are quite cool to look at, and of course the setting is so unorthodox that it really does deserve some merit! If an alien attack happened in such a place… I’d bet these sorts of kids would fight back! It is fun to watch such a “versus match” unfold. Yes, the sorts of characters may well be anti-heroes and quite fun, but I could understand some viewers finding them annoying; it is a social matter, but I think the film tries – in its simple way – to suggest they could be decent people deep down. It is loaded with silly one-liners and pop culture references that will undoubtedly make it a time capsule of sorts, but it is an entertaining hour and a half!